Alright now, for as much as I talk about wanting this place to be a place of substance, I can't help myself. I just have to talk about Downton Abbey. 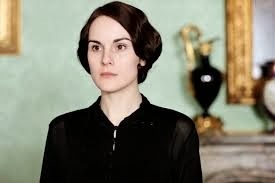 Anyway, despite my earlier post claiming that I wanted to start blogging again by writing what I would want to read--or maybe because of that claim--I've decided that the Downton Abbey posts must stay. I get a lot of pleasure from writing them, and I suspect that some of you get some pleasure from reading them. And now you're thinking, as am I, that it's very near the end of Tuesday and this post may be bordering on being outdated. That's O.K. I'm not giving any excuses because there just may have been a hockey game to attend on Sunday night and then I had to watch DA a couple of times to make sure I got this right. I promise, not every post will have this many caveats attached to it. So now, as I've done for the previous three seasons, I bring you my Top 5 Lines from Downton Abbey, Season 4, Episode 1. Such sadness in the big house, isn't there? Matthew has been gone for six months and Mary is still looking like a deer in the headlights. Poor thing. We'll get to her. Things are in an uproar right away because O'Brien has left. Who knew that a Lady's Maid leaving would cause such trauma both Upstairs and Downstairs? That O'Brien really had a way of causing a ruckus, and she's still managing to do so even by NOT being there. 1. And Thomas. Still up to his old tricks. My first favorite line came fairly early on in the show when Thomas was sitting around (he never really seems to do any real work, does he?) 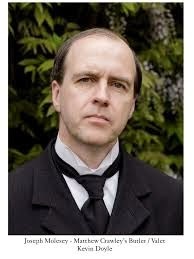 complaining to Mr. Bates about Nanny West who had asked him to do her a favor. Bates: You mean she mistook you for a servant? Alfred, confused as usual: But he is a servant. Bates: Don’t tell him that, he’ll never get over the shock. 2. Ah, Violet. My Lady was in beautiful form this week as she handed out advice and one-liners like penny candy to the children. Violet, in an attempt to pull Isobel out of her grief, pays a visit to Crawley House, suggesting that Isobel snap out of it. Violet: You say you have no purpose. But what about Little George? Surely you’re interested in him. Isobel: Of course, but I’m not going to drive Mary mad by interfering. Violet: It’s the job of grandmothers to interfere. Tucking that one away for the future. 3. Poor Mr. Molesley. I felt so sorry for him this week, and I wonder what will be in store for him as he's sunk so low. But I loved the sweet scene between Mr. Molesley and his father, Mr. Molesley. It seems there was a lot of shoring up to do this week because between Violet and Mr. Molesley the Elder, there was a lot of good advice dispensed. Here's the line I loved: In your game, if you want the best, you have to be the best and work at it. Good parental advice from the elder Mr. M.
4. And what about the sweet scene between Violet and Mary in Mary's bedroom? Words that rarely have been spoken at that house seemed to make all the difference. Mary: I suppose you think I behaved very badly down there. Violet: My dear, I’m not very interested in whether you behaved badly or well. Violet: I’m not your governess. I’m your grandmother. Mary: And the difference is? Violet: The difference is . . . I love you. 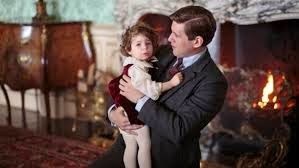 I don't think I've ever heard a Grantham speak those words--they just weren't said back then--but as soon as Mary heard her grandmother say them, she seemed to perk up, confessing to Violet that she didn't think she'd make a very good mother. And Violet spoke such life-giving words to her granddaughter (and to all of us who feel we've failed at motherhood a time or two): My dear, there is more than one type of good mother. Thank you, Dowager. Thank you. 5. Finally, I had to choose the scene between Mrs. Hughes and Carson toward the end of the episode. The two were in Carson's office discussing his broken relationship with Mr. Griggs, and Mrs. Hughes offered this gem of wisdom: It’s an open wound. I don’t know why, but I do know this—you’d do better to stitch it up and let it heal. Oh, there were so many more good lines and wonderful scenes, but I had to keep myself to five and these are my favorites. OK, if I were to add one more, it would be the tender scene between Carson and Mary in Carson's office when she finally broke down and cried, and Carson comforted her: You cry, my Lady. You have a good cry. That’s what’s needed now. And when you are ready, you can get to work. Because you are strong enough. You are strong enough for the task. Downton Abbey, I'm so glad you're back. These cold winter nights are made just a bit warmer with you around. How about you? Did you watch? What were your favorite lines? I loved loved loved it that Mrs. Patmore sent an anonymous valentine to Daisy ... so she would have something to open. And when she is worried that Daisy will be mad, Daisy says, "I may not have a follower, but I have a friend." Oh yes, Glenda. I loved that one too! See? I could have done ten lines! I'm so happy that you and Downton are both back! Thanks, Becky! I'm so glad YOU'RE back! I missed you....happy to start my year off right with both you and Downton.